Timeless metal fencing suitable for residential use. Suitable for modern and traditional properties. 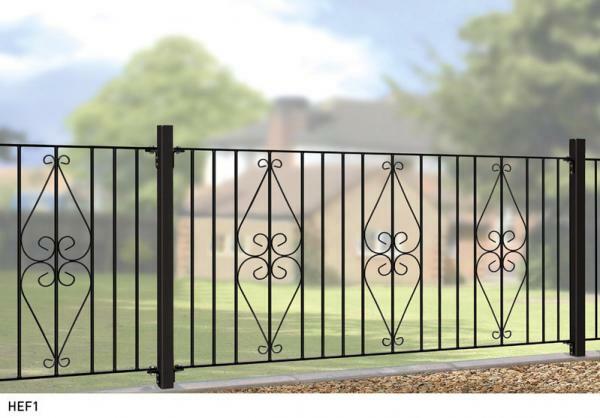 Constructed from low maintenance zinc plated steel the attractive Henley Metal Fence Panels will provide privacy and security whilst retaining charm and character. 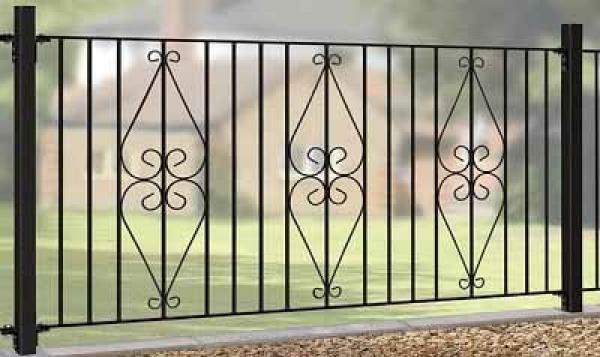 Featuring sturdy infill bars and decorative scrollwork this timeless metal fencing design is ideal for creating a defined boundary to any residential boundary or garden location at an extremely competitive price. Henley metal fencing is suitable for most styles of property. Traditional metal scrollwork creates a classic appearance. Constructed with zinc plated materials help protect against corrosion. Features 25mm x 6mm frames, 10mm infill bars and 10mm x 3mm scrolls. Metal fence panels have a factory applied black powder coated finish. The sizes represent the opening into which the fencing will fit. We have already made an allowance for the space needed for the fittings. Need advice before ordering the Henley metal fencing? If you need assistance with sizes or working out the number of fence panels to order please contact us using the enquiry form or call us on 0844 804 5577. For more common queries please read the frequently asked questions and ordering guide page. If you need to order metal posts to provide support for the Henley fencing panel please choose from the options below. If you are unsure what to order or would like a post type that is not listed please call 0844 804 5577 or email sales@gardengatesdirect.co.uk and we will be pleased to discuss your options, offer solutions and answer your general queries.